Confession: When I first added Mount Kilimanjaro to my Life List, I actually had absolutely no intention or desire to climb. I was content just seeing it from the base. In fact, I even noted that. 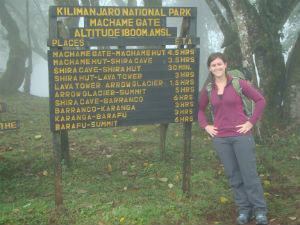 Standing at the Machame gate waiting to start the climb. How/why am I standing at such an angle? However, something changed after I signed up for CCS. One day it just hit me as if a ball bopped me on the head and I realized there was no way I could go to Tanzania and NOT climb. It just wasn’t an option to leave with that regret. I didn’t know exactly why I wanted to do it, I had never done any serious mountain hiking, never even been to Colorado before (to know how I reacted to altitude), nor had I trained in the slightest bit to prepare for climbing, but none of that fazed me. Something in my gut said DO THIS! Perhaps it was me wanting to start a clean slate and put the past behind me, maybe I just wanted to say I climbed Kili, or maybe because it was The Year of Caryn and what better way to honor that than climbing a freakin’ mountain to The Roof of Africa? Maybe it was to have that personal victory of climbing Mount Kilimanjaro. Or maybe it was to show the ex that I wasn’t being held back anymore. Perhaps it was to prove to myself that I could do it, or to show the world that I could camp out and climb a mountain with the best of them and prove that I wasn’t just another prissy jewish girl. Maybe it was another way to distinguish myself from my peers or from being compared to my sister. Maybe it was to make my parents proud of me. Maybe it was all or none of that. The why didn’t matter to me, what mattered was that I wasn’t going to leave the country without reaching the summit. It was gonna happen, dammit! After deciding, I was more caught up in the act of making sure I had all the right clothes and gear than I was about going to volunteer in a foreign 3rd world country. It took nearly all my energy and research and money. But I was prepared! I meticulously rearranged my trip so that I could still do everything I wanted to do while in-country. 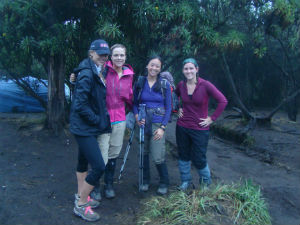 The three other girls in my group and I had arranged to climb with Climbing Kilimanjaro Tours. There were definitely pros and cons but overall they were great. After stopping in town to pick up rental gear, we were off! 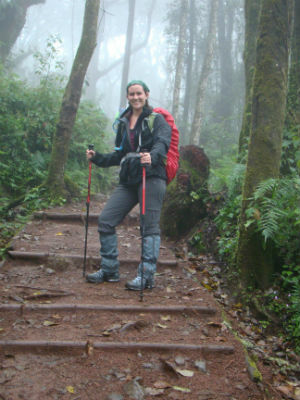 On the way to the Machame route gate, I felt as if I was being driven to my death with a slow march of music playing in the background and silence all around. I didn’t actually think I’d die but it felt like a movie being played on mute as I watched myself drive closer to the gate. There was no turning back and I was teetering on how I felt about the climb. I was nervous but knew I had to stay positive and put the “can do” attitude to the test that I had worked on creating this year and preached about on my blog. I was most concerned about altitude sickness, hallucinating at the top and the loose rocks. October 14, 2012. Not only was this the day that I anxiously waited for as the day I’d start my 7 day trek up the World’s Tallest Freestanding Mountain, this was also the day I had been waiting for since I got engaged. This was the very day I was supposed to walk down the aisle and become a Mrs.
Talk about irony and symbolism. I was going to “begin my climb on the mountain of marriage” but instead I wound up quite literally climbing a mountain. I knew when we booked that date it would be significant and about new beginnings and adventures but I didn’t know it would be a date I’d forever remember for an entirely different adventure. It was a total coincidence, completely unplanned to have both events on the same day. Just how the Universe had it work out because of external factors: When the boss approved me to go to Africa (after rejecting April & August), and having to change volunteering from 4 weeks to 3 instead of extending because my sister planned her wedding 3 weeks after I was to return. This was a date that always seemed down the road, off in the future, but it caused me much anxiety as it loomed over me and slowly approached. Focusing on preparing for the climb helped me to not think about the wedding (or as much, as I would have otherwise). It helped divert my thoughts and energy away from missing him. But just like that there was no more waiting for October 14th to arrive. The thing is, time never stops and no matter how hard you wish it away, that day always comes eventually. And it always passes. I was glad I had the climb to preoccupy my mind but that day took the cake as the winner of ALL THE EMOTIONS. The usual Holy crap, I am about to climb a mountain thoughts on top of the Oh look what time it is now?! Right now I would have been getting my makeup done, putting my dress on, walking down the aisle, saying I Do, having our first dance… The weight of the day was enormous. I spent most of it inside my head. To look at my watch and clearly envision the alternate universe as it would have been happening at that very moment was a very complex out-of-body experience. It was extremely depressing and disturbing yet justifying. Justifying because here I was embarking on an amazing adventure of climbing to The Roof of Africa thinking about what could have been, how much I had accomplished and the dreams I conquered. I was truly disconnecting from the world for a week to do nothing but get lost in thoughts of self discovery and to successfully achieve that personal victory. A week later, after my climb finished, I found out that it was one of the worst days of Chicago weather all year with tornado warnings and torrential rain. It would have been a nightmare to have a wedding that day. Funny how things work out, isn’t it?